When an eye expert talks about measuring a patient’s vision after a head injury, the doctor is usually talking about visual acuity. Visual acuity is the straight-ahead vision- this is measured on an eye chart while looking at a chart of letters (the chart with the big letter “E”), where normal vision is called 20/20. We are are all familiar with this type of routine vision test, but this test only measures straight-ahead vision- what is in the center of a person’s focus. Visual acuity is an important assessment when evaluating a victim of a traumatic brain injury, but we all know there is something called peripheral vision. When a human being looks at an object (let’s say a flower), that person is aware of the color and shape of the petals, but that same person is also aware of the plants, the trees, the grass, and the sky that surround that flower. This is called peripheral vision and is very important to normal function in the real world. People use peripheral vision when driving to avoid accidents- it’s obvious. What happens to a person’s peripheral vision after a head injury, a major automobile accident? Unless there is a direct injury to the eye, the visual acuity remains normal (20/20), but patients often complain that their vision is not normal. Medical research shows that 30%-40% of these patients with mild TBI have visual field deficits (deficits in peripheral vision). How do doctors measure these deficits? Ophthalmologists interested in TBI victims perform visual field tests in their office. A visual field test looks like a large bowl, where a person can rest his head. On the surface of the bowl are tiny openings that allow pin point lights to turn on / and off (like small holiday lights). Each eye is covered separately and the person is asked to look at a target in the center. A computerized device then turns on and off a complex series of pin point lights, and the patient is asked to push a handheld clicker each time a light comes on. After approximately 15 minutes, the visual field device prints out a complex map of that person’s vision. I wish to avoid a detailed discussion of how the vision centers in the brain are wired, but a lot of research has gone in to such mapping. The important point is to recognize that TBI victims frequently have visual field deficits that can be objectively printed out, and have real meaning. This can only be done if the TBI specialist does the test, but most TBI specialists simply don’t. 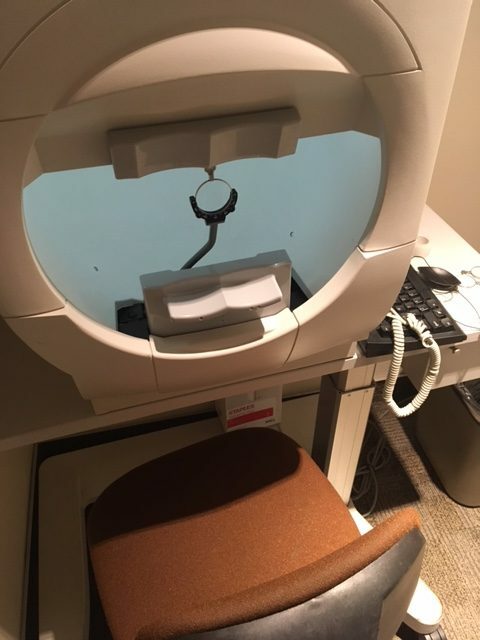 State-of-the-art visual field devices (known as perimeters), are expensive and are usually only in the offices of eye doctors. Eye doctors use such tests routinely in testing their patients for a disease called glaucoma (high eye pressure). But the same perimeter is very useful in evaluating TBI victims. As I have stated in previous blogs, very few ophthalmologists are interested in TBI victims. Such patient’s straight-ahead vision is often 20/20 and the testing stops. I have examined hundreds of TBI patients, and they often have visual field test abnormalities, and these deficits are important in describing a person’s injury. These peripheral vision deficits can have real world consequences. Visual Field tests can also be repeated and tracked to see if deficits improve over time or remain permanent. This can be very important in establishing a long-term prognosis for TBI victims. Permanent visual field loss can be quite disturbing to an individual- ask anybody who has suffered a stroke and lost peripheral vision. We don’t hesitate to accept that stroke patients can have visual field loss and need help, but very few doctors choose to even evaluate visual field loss in head injury victims.